I do not have a whole lot of pictures from the last day of the ride, as my camera was mostly wrapped in plastic, safely stowed away. 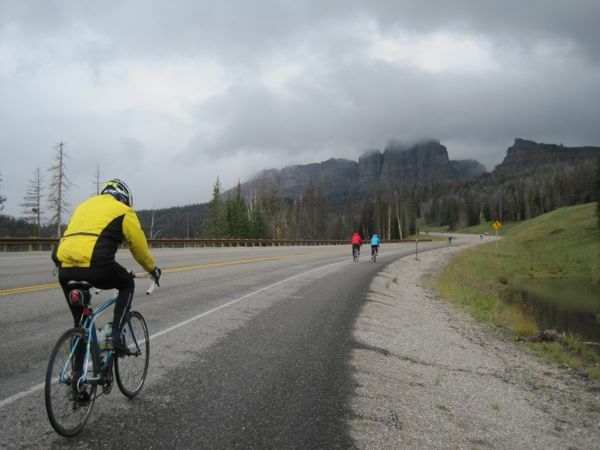 It was another rainy ride, and with an ascent over a mountain pass, a darned cold one, too. I really regretted not having my rain pants. It was hard to leave the nice, warm building in Dubois. As tempting as it was to linger over breakfast, we were under deadline pressure. 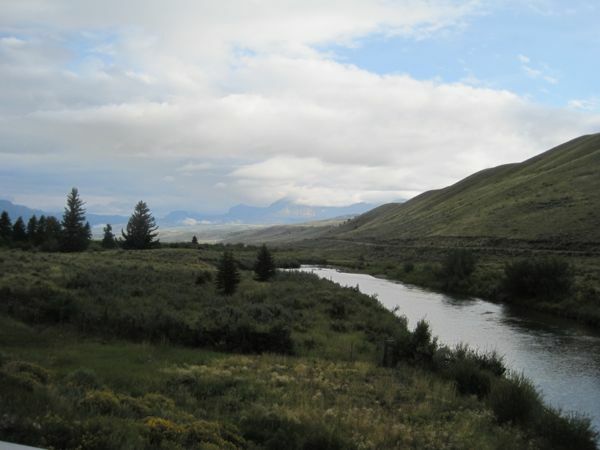 We were scheduled to meet a bus at Moran Junction that would take us back to our Day 0 camp in Teton Village. We got the bike out of the tennis court corral and hit the road, our bike shoes still damp from the day before and overnight rain. 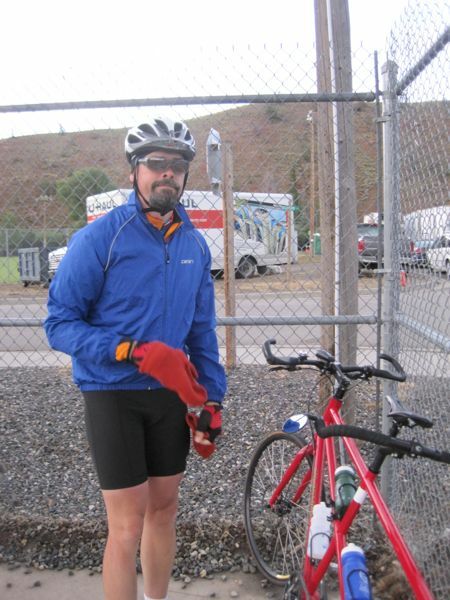 Bugman had a thick windblocker cycling jacket on over his short-sleeved jersey in addition to his regular shell. 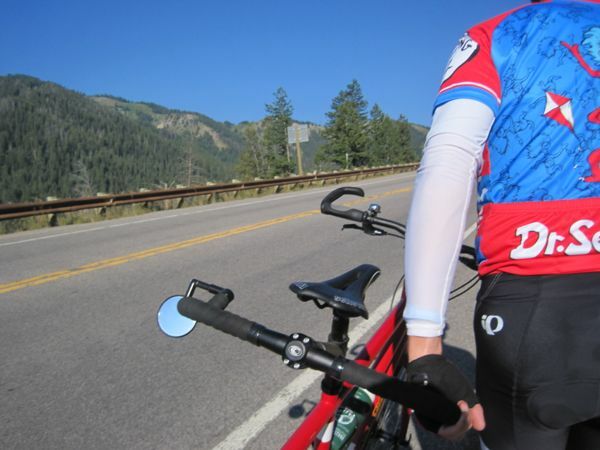 I wore a cozy long-sleeved jersey under my shell, on top of a short-sleeved jersey. We both had fingerless cycling gloves topped with fleece mittens. Our bike trunk was stuffed with our rain jackets and long pants. Only 53 miles to our destination, and lunch. The mountain peaks were shrouded in cloud, still half-asleep. That’s kind of how I felt that morning. We dodged a couple of rain showers early, but our luck didn’t last. With the wind chill, dampness, and thin bike socks, Bugman’s feet started to ache from the cold. About 10 miles in, at the top of a small hill, we pulled over so Bugman could try to get some circulation back in his feet. 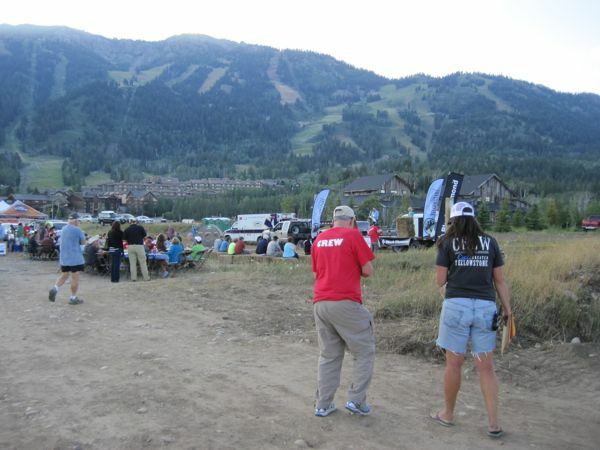 Nearby, a course volunteer was sitting in his pickup truck, keeping watch on the cyclists. I trotted over to ask about the possibility of purchasing a dry pair of socks from the CGY store and having them sent ahead to the next rest stop. Instead, the volunteer dug around in his gear and found a pair of thick wool hiking socks. He had Bugman get into his truck and turned the heat up full blast. Bugman changed out of his wet socks and held his feet under the heat register for a few minutes before putting on the dry woolies. “Ahhh! Much better!” Bugman said. He later commented that, if it were not for that volunteer and his wool socks, he probably would not have been able to finish the ride that day. I was glad when the rain let up, not just because the misery abated, but because we could see the fantastic scenery. Bugman wound up peeling off the detachable sleeves from his thick windbreaker jacket. The exertion of the climb generated some heat. Clouds were starting to roll in again across the tops of the mountain peaks. It was getting colder the higher we rode. Early Christmas? It just about felt cold enough. At a rest stop around mile 25, we noshed some snacks. I remember there were volunteers cheering for us at that stop – including a boy hollering “wakka wakka!” Fozzie Bear fan, perhaps? Bugman was getting chilled again, so he pulled on a pair of thick fleece pants over his bike shorts. High noon, and we were nearing the top of the pass. On and off drizzle kept things chilled and damp. Yay! We made it to the top of the pass! At this stop, Bugman put the sleeves back on his windblocker, in anticipation of the windchill on our way down the mountain. 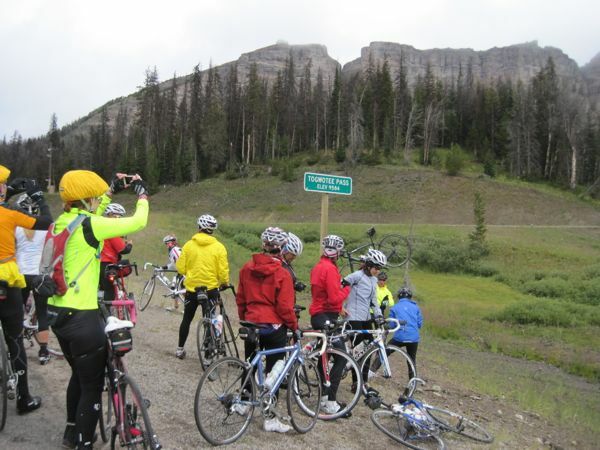 A lot of fellow cyclists stopped to celebrate at the apex of this mountain pass. It had been a hard climb. But we had miles to go before lunch and the end of the ride. And the rain wasn’t done with us yet. Crossed the continental divide again. Now for 17 miles of 6% grade downhill. If it had been a warm, dry day, the descent would have been exhilarating. In the rain, with it cold enough to see your breath, it was not so fun. 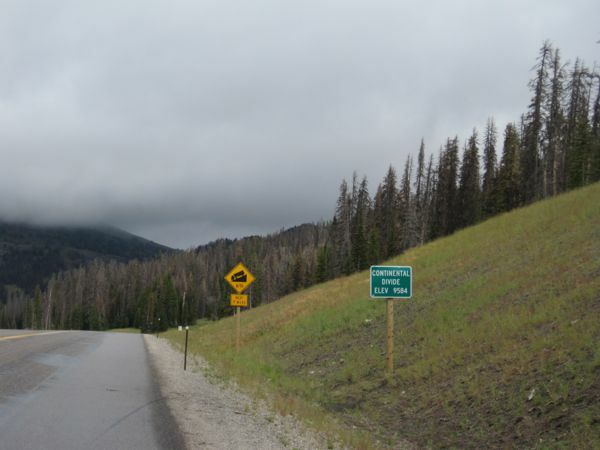 Our descent of Togwotee Pass was pretty miserable, but we kept at it because we knew there was an end in sight. Every sag wagon that went by was packed full. We were determined not to add to the passenger load. A couple of times, we passed cyclists changing flat tires in the rain. I felt bad for them! The rest stop at mile 39 was a godsend. They had coffee! Hot coffee! I threw back a couple of cups along with some trail mix and felt a lot better. I also finally broke down and pulled on my running capris, which I had been using as pajamas and had packed in the bike trunk that morning, just in case. I encountered a girl in the line for the porta potty who was having a complete meltdown. She was upset because she had been picked up with a flat tire by the sag wagon and then was asked to exit the vehicle at the rest area. She was apparently thinking she was going to be abandoned on the mountain there, and was trying in vain to get cell signal to call her father to come pick her up. She did ultimately get back onto another sag wagon to get the rest of the way down the mountain. I suspect the volunteer crew was rounding up people off the cold, wet mountain and gathering them at the rest stop, where at least there was some help. I wonder if there weren’t some people suffering from hypothermia up there. I was uncomfortably cold, but not life-threateningly so. But I had on several layers of clothing. I could definitely see how someone who was less prepared might be having serious trouble. 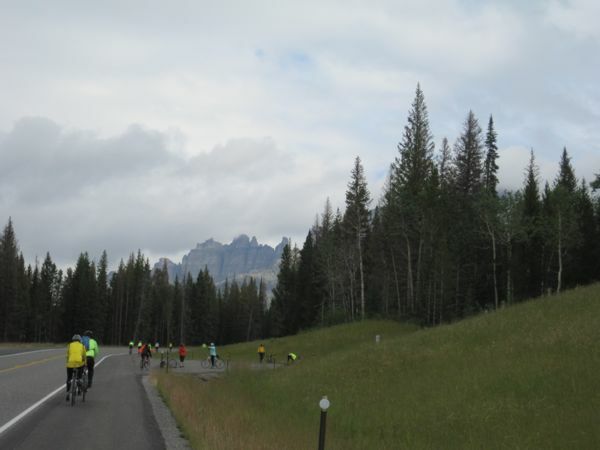 The ride organizers had made much ado about the views we were supposed to have of the Tetons as we descended the pass, but the rain scuppered the vista. We weren’t able to see the mountains ahead until we descended out of the clouds and were on the flat again. It continued to drizzle pretty much the entire last portion of the ride. You couldn’t get too close to another cyclist, or you risked spraying them or getting sprayed by the water coming up from the tires off the wet road. I could feel my feet squelching in my shoes. The end of the ride was pretty anticlimactic. 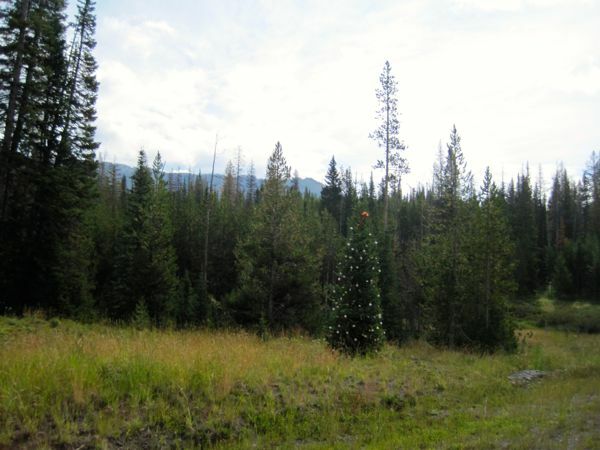 We showed up at Moran Junction, lay down our bike to be packed onto a truck, scarfed lunch, and then stood soggily in line, waiting for the buses that would take us back to Teton Village. A volunteer offered a blanket, in case someone was desperately cold. As the course closed down, the sag wagons were pressed into service as cyclist transport back to Teton Village, and it was on one of these that we found our way back. 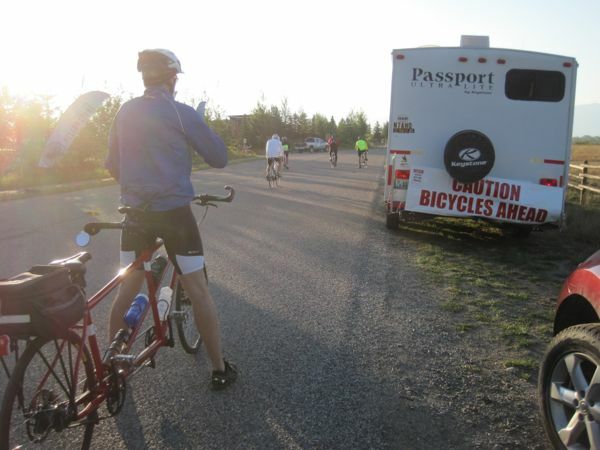 There was a pleasant camaraderie among the cyclists, particularly as we had another mini-adventure when our driver chose to take Moose-Wilson road from the north instead of taking the south route via highways 26 and 22 through Jackson. There were portions of that road that were unpaved and mighty bumpy! Too bad we didn’t see a moose or bear spring from between the trees. That would have made a good story. 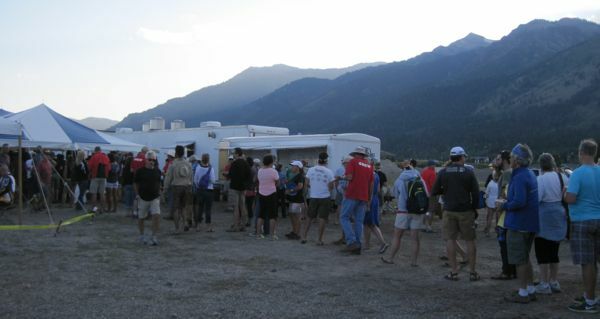 At Teton Village, we walked through the mud in our bike shoes to get to the campsite where we could pick up our luggage from the tent Sherpa guys. As soon as we had our bags, I immediately put on dry socks and shoes. So much better! Since our bike was not back in camp yet, we climbed wearily into our car for the 20-minute drive to our B&B in Jackson – the Alpine House. 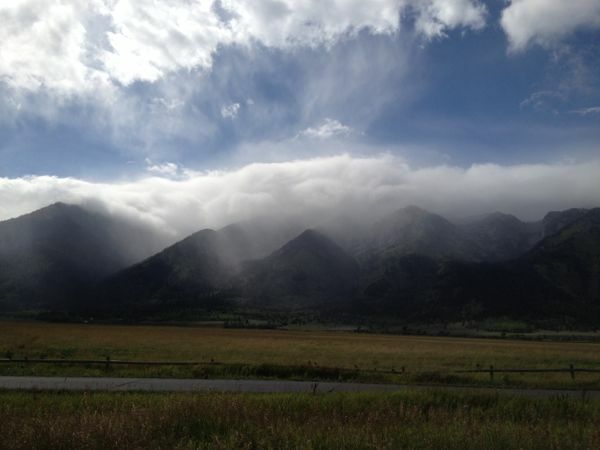 The car-window view of the mist-shrouded Tetons on the drive to Jackson was breathtaking. Warm showers, dry clothes, chocolate chip cookies from the B&B, and we were feeling much better. Bugman washed his borrowed wool socks, and we drove back to Teton Village with them draped over the air registers in the car to dry. We packed our bike on top of the car, returned the borrowed socks, and headed over to find the after-ride party in the Commons Area. When we finally found someone who could tell us where the Commons was, we were disappointed. The Commons was an outdoor area, and the party had been cancelled due to the chilly weather. Oh well. We didn’t enjoy the afterparty last year all that much anyway – the music was too loud. We headed back to Jackson, ate an intemperate amount of pizza, and crashed into bed. The next day on the drive home, we retraced our mountain pass route and found . . . snow! 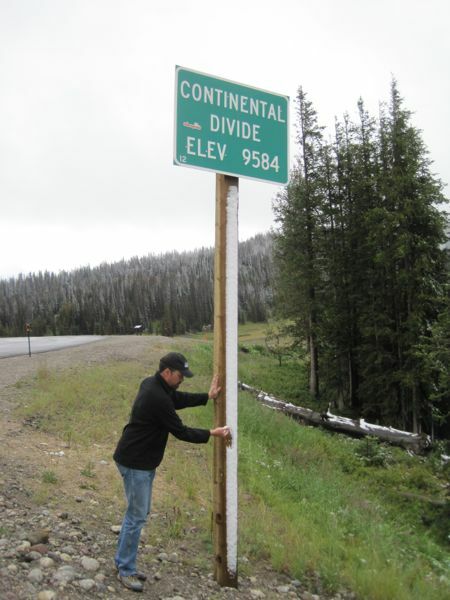 Bugman scraped some snow off the continental divide sign to throw the first snowball of the season. I am so bummed I did not think to make and photograph a miniature snowman. That would have been my earliest-ever snowman, on August 24! 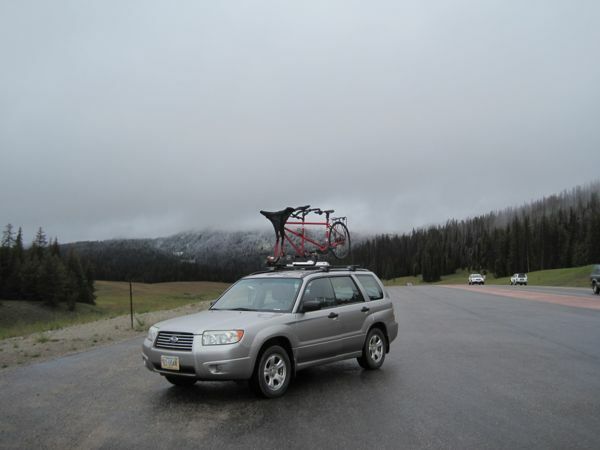 The final image of Cycle Greater Yellowstone 2014: our bike atop the car, on frosty Togwotee Pass. Next year, I will for sure bring my rain pants! 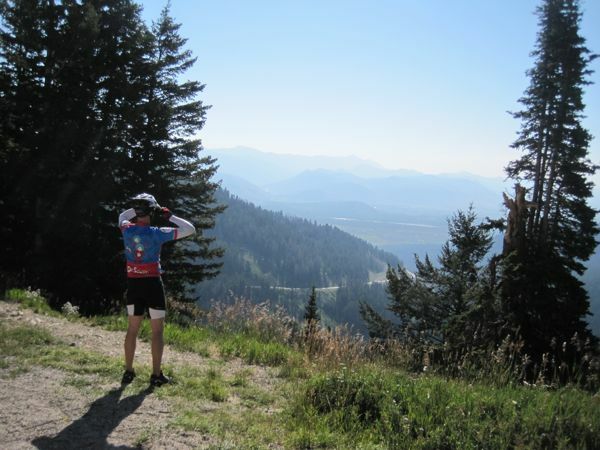 Just look at the elevation profile of that first climb over Teton Pass! That’s 5 1/2 miles of 10 percent grade!!! 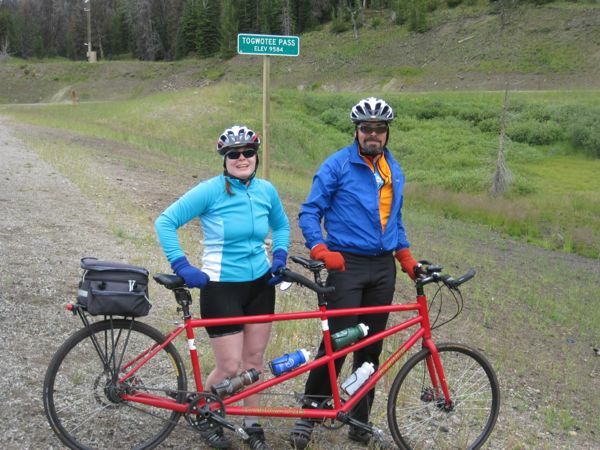 And us on a tandem! Well, nothing else to do but get on with it. As we set out that first morning, I blanked the coming climb from my mind, like how I went mentally blank on the plane ride that time I went skydiving. La la la. What a beautiful day. Ignorance is bliss. 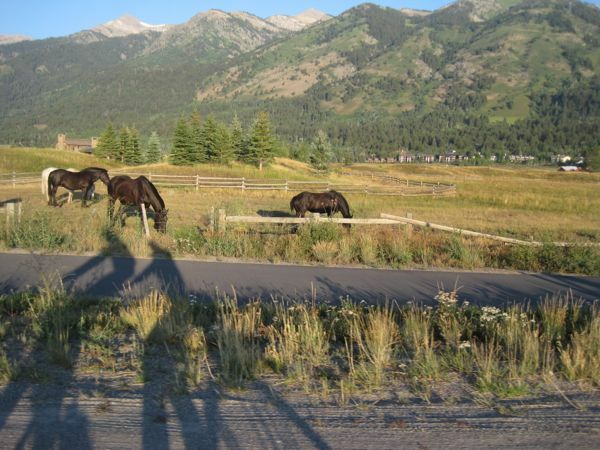 Our morning tandem shadow overlapped a lovely bike path at the edge of a horse pasture set against the backdrop of the mountains. The Jackson area has some great bike paths. I want to go back there. 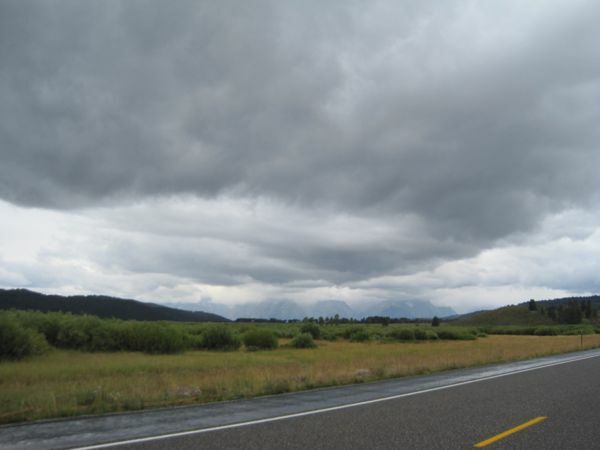 I looked to my right and marveled at the Teton Range stretched out to the north. Lovely! Then I looked over Bugman’s shoulder and saw what lay ahead in the continuation of that mountain range to the south. The yellow sign read “steep mountain pass ahead 10% grade.” Oh, *bleep*. We are about to climb up and over that?? 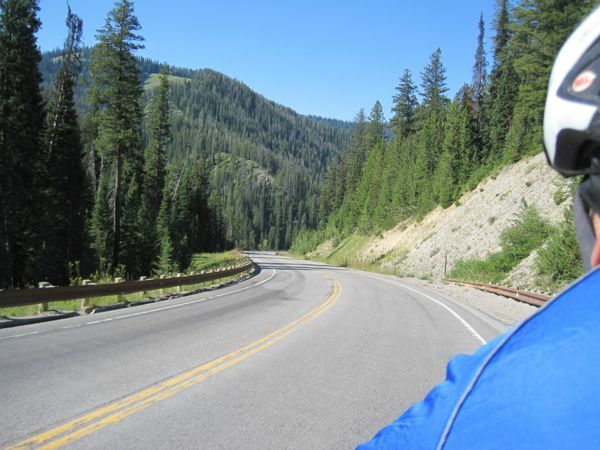 Here’s what it looked like at about mile 11 of the morning’s ride, not even halfway up the Teton Pass yet. We were averaging about 2 mph in “granny gear,” making it tough for Bugman to steer our big rig. We were taking just about every opportunity to pull out and stop for a breather, but our opportunities were limited. If we didn’t find a pullout or driveway set back far enough from the road to get a bit of perpendicular momentum, the slope was too steep for us to get started again. It’s a real trick to start a tandem on a steep upslope – one we haven’t mastered yet. Five minutes later, we were hoofing it. I’d been pushing myself too hard in that thin air, and I felt my chest tightening, and I started to get panicky. Exercised-induced asthma! I’ve had similar episodes before, in cold weather or when pollen counts were high, so I knew what to do. We stopped short at the side of the road (apologies to the cyclists behind us! ), and I tried to take deep, slow breaths and think calming thoughts. I was able to breathe again in short order, but we were stuck walking until we could reach a pullout. We were not the only ones walking. We got back up on the bike and made it around a bend to a flatter area around mile 12 where a creek drizzled underneath the road. The ride organizers had placed an encouraging sign. There was a hint of “Ha! Yeah, right” in my smile. Stopped for a *ahem* photo opportunity (breather!) around mile 13 and looked back at the road we’d come up. 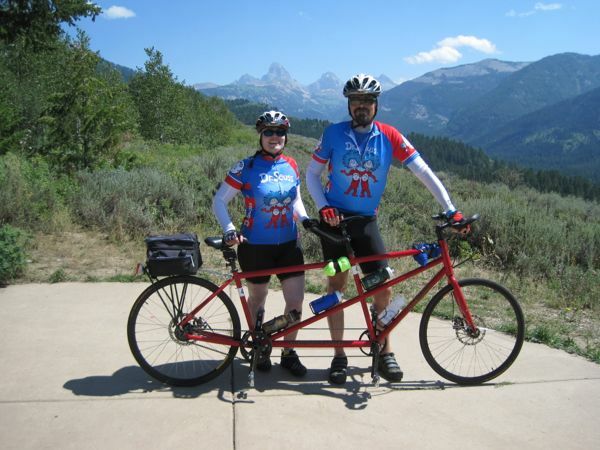 A couple in a car stopped at the pullout to ask about all the cyclists and to compliment us on the tandem – they had been tandem riders themselves and told us about the Midwest Tandem Rally. Small world! We weren’t the only ones having a hard time. Look how full the SAG van’s bike rack is (the lead white van in the line of 4 vehicles). But there is hope! See that utility tower in the distance? The wires attached to it angle DOWN at right! I was so excited to finally be over the peak of that climb, I wanted to document it with a photo, despite simultaneously wanting to hang onto the bike for dear life as we picked up speed on the descent. 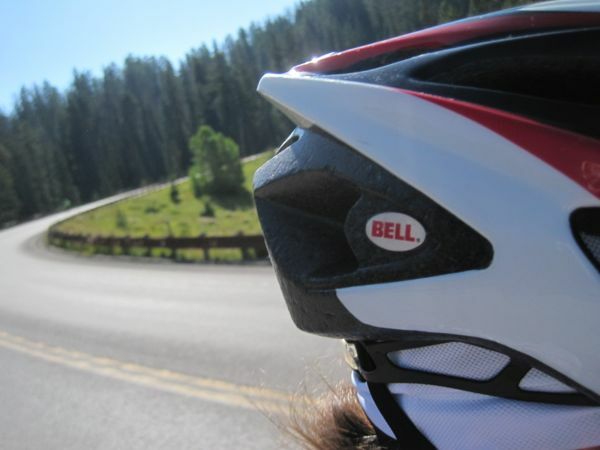 I wound up getting a nice photo of the back half of my helmet as I pointed the camera upslope behind me. Here’s a better shot of the downslope, taken over Bugman’s shoulder. Because of the tight curves, narrow shoulder, and volume of traffic, he really rode the brakes on this descent. (Love our disc brakes!!) We topped out around 26 mph. 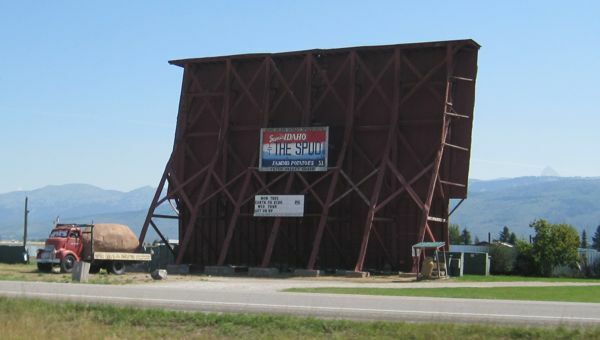 Between Victor and Driggs, we rode on a lovely, flat bike path past a drive-in theater, complete with a ludicrously oversized spud displayed on a truck bed. This was also where we learned that orange markings on the ground indicated road hazards. Bugman inadvertently hit an orange-marked bump and nearly launched me from the bike. Our lunch stop was in front of the Teton Geotourism Center in Driggs. 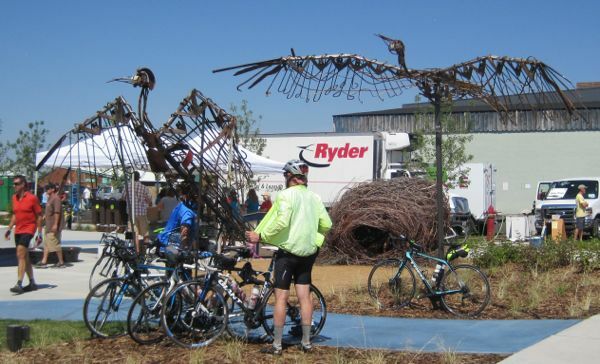 You can see the lunch distribution tent and caterer’s rented truck behind the birds-and-nest sculptures. They have a rather unusual lawnmower there in Driggs. (Shortly after this photo was taken, the woman reprimanded her horse for eating the lawn, and the horse responded with an indignant whinny.) 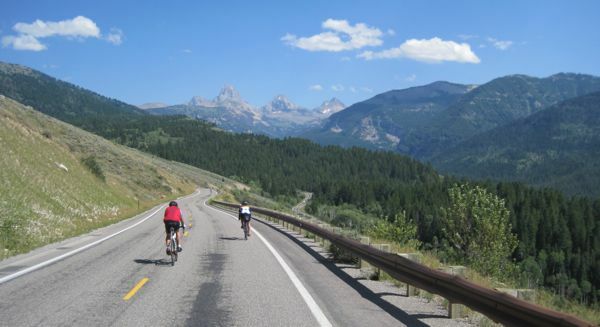 We found out about an accident that happened on the Teton Pass descent when the two gals involved approaches us because of our tandem. They were on a tandem, too, but their bike had rim brakes. On that steep descent, a rim overheated and blew a tire. The stoker, in her words, “ninjaed” off the back seat and was pretty much unscathed. The captain went down with her ship and wound up with various scrapes and contusions. 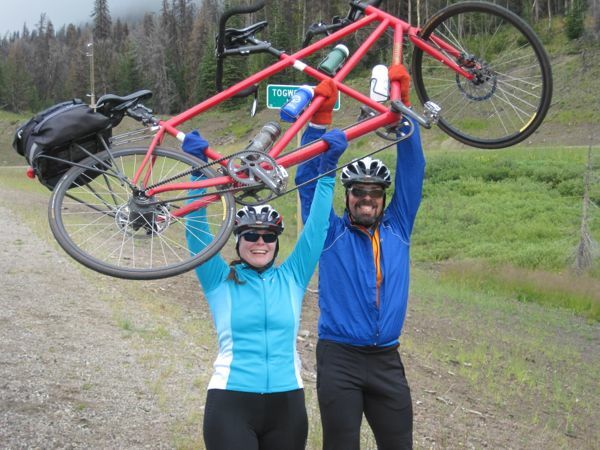 But I have to hand it to them – they got right back up there, renting single bikes for the day to complete the ride while their tandem was being repaired. Props! 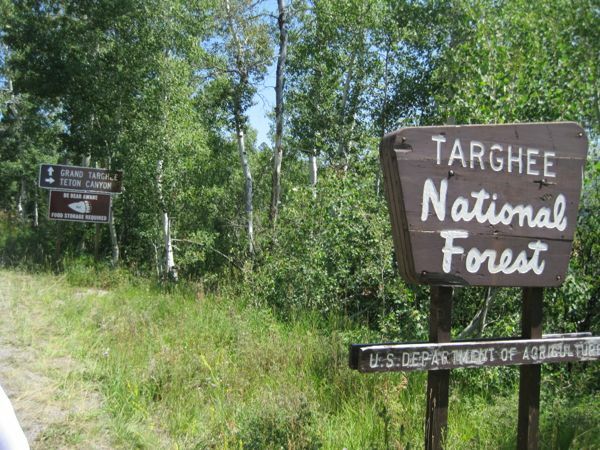 We dipped into the Targhee National Forest again on the way up to Grand Targhee Resort. It was our second high climb of the day, but not nearly as steep. 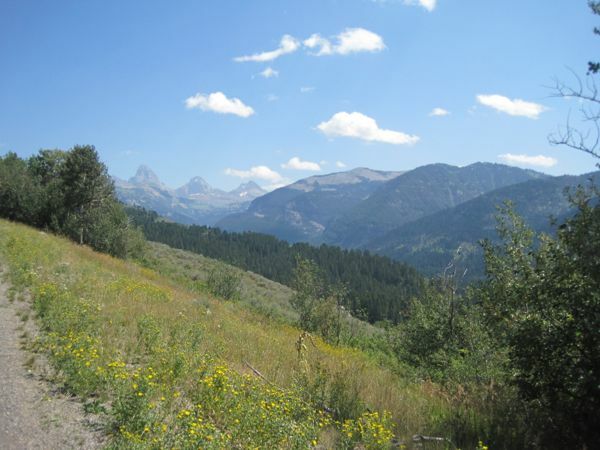 The views on this ascent were much better than on the Teton Pass ascent, too. Beautiful scenery at the rest area! 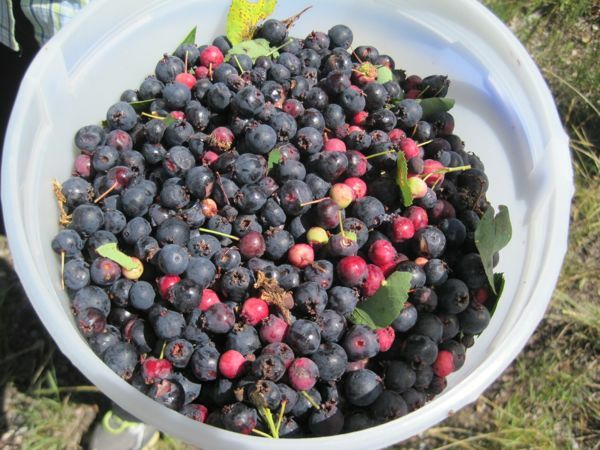 We got a taste of serviceberries from a couple of folks out gathering them at the side of the road. “Bears really like them,” they said. “So do hungry bikers,” I would add. 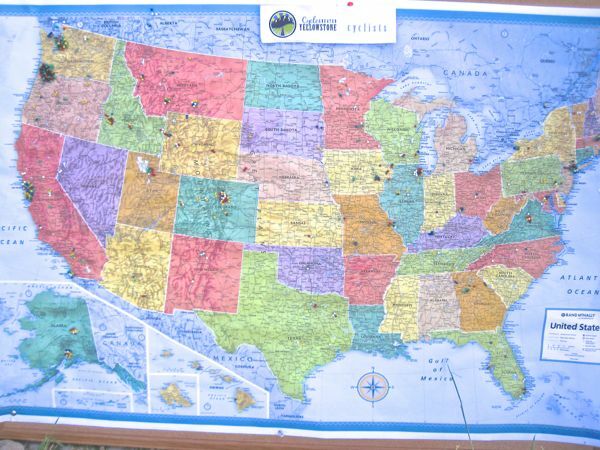 MAN – would ya look at the scenery around here?? Beautiful!! 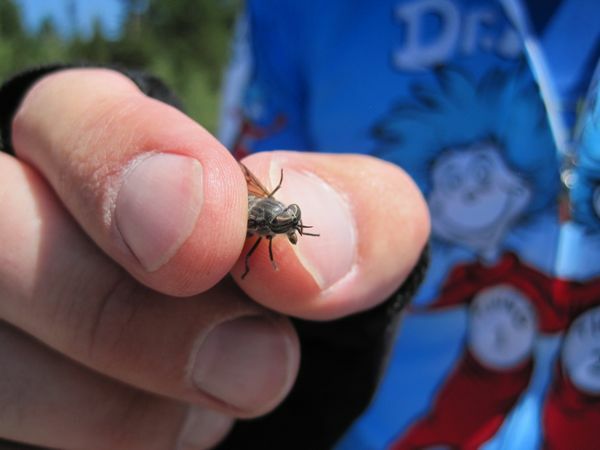 At a roadside breather stop, a biting fly started stalking us. Bugman stalked it back and caught it. When he released it, it flew away and didn’t bother us again. Our first wild mammal sighting! A weasel! 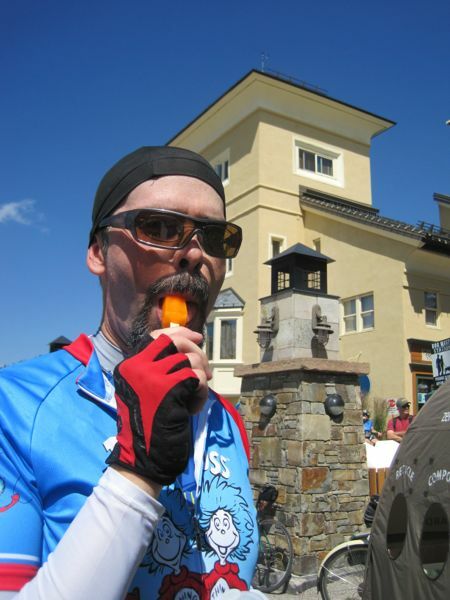 The day was getting pretty warm (I will spare you the photo of how weird my legs looked with sweat beading up on top of the sunflower-oil-and-beeswax-based zinc sunscreen), so a popsicle was mighty welcome! We could have taken a ski lift up further to get more of a view, but we just wanted to get back to camp. Awww . . . Bugman made a friend. 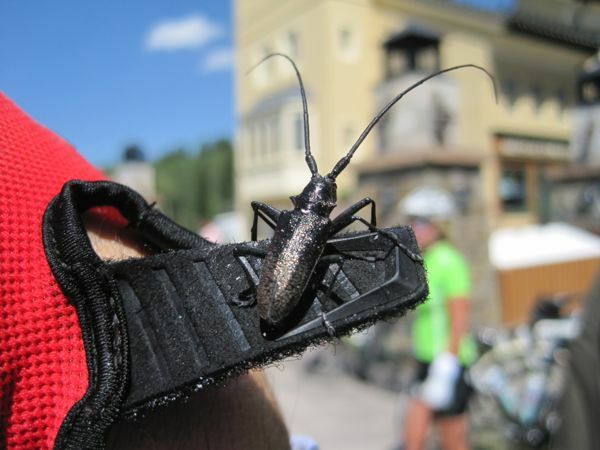 After he caught it, this longhorn beetle hung out on his glove strap. What’s the species, Bugman? On the ride back towards camp. Seriously amazing views out here! 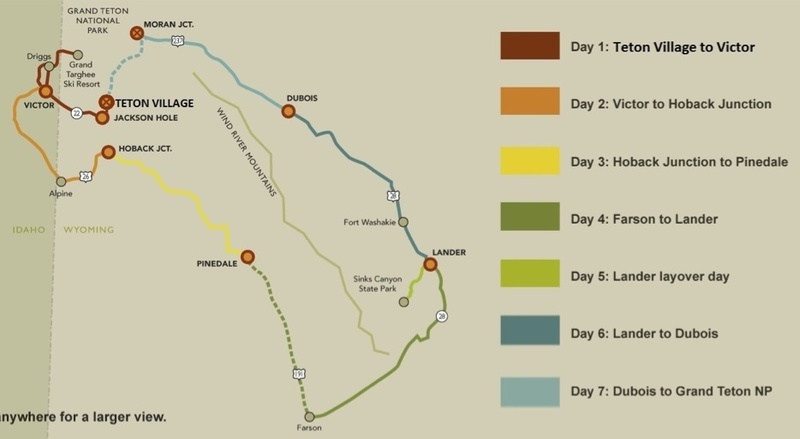 When we got back to downtown Driggs, we faced a headwind and a choice: complete the mapped route with a 17-mile loop to the west, or backtrack straight south 7 miles into camp in Victor. We were exhausted from the day’s climbing and chose the latter. 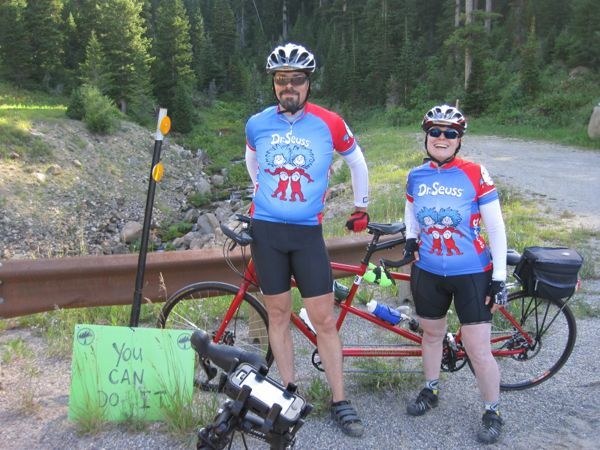 On our way back into Driggs, a strange, loud squeak began issuing from our bike. I don’t like strange, loud squeaks coming from any of my vehicles, so when the noise continued on the route into Victor, I made Bugman pull over so we could investigate. It turned out to be quite a sticky situation – literally. Up at the resort, we had filled one of our water bottles with Gatorade. The bottle had leaked onto our bike’s belt drive, making it sticky. The squeak was quickly dispatched with a few squirts of water. Finally, we made it into camp in Victor’s Pioneer Park. 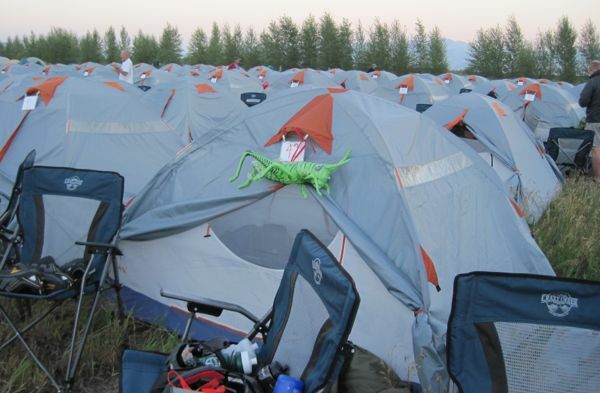 We set up housekeeping in our tent on a ball diamond outfield, waited in line to shower, made a brief stop at the local tourism table (where they had USPS mailers ready to ship our selected brochures direct to our homes – genius! ), and . . . nearly fainted with hunger when we saw the length of the dinner line! When you’ve been out biking all day, you want to EAT!! NOW!!! 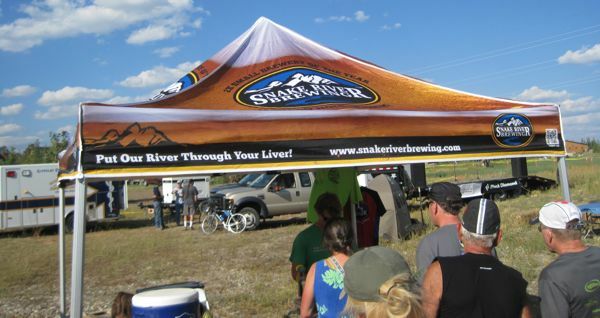 I went to the adult beverage tent to get refreshments to sustain us during the long wait, and I was presently so looped by the 7% beer hitting my empty stomach that I didn’t much care about being hungry anymore. After devouring our loaded baked potatoes and listening to announcements, we tucked in for the night. 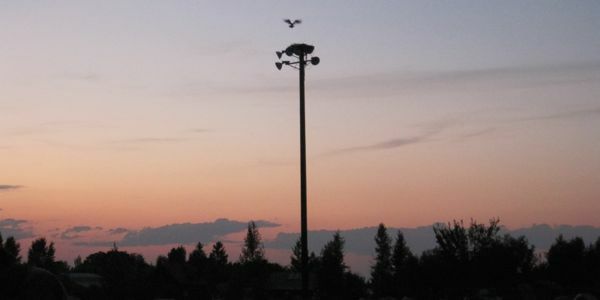 So did the osprey nesting on a lightpole in our campsite. UPDATE: This is what happens when all the days blend together when I’m blogging several days after the fact. I forgot a very important aspect of how this day started. On the morning of Day 1, there was a disturbance in the Force. Hundreds of voices cried out in dismay. 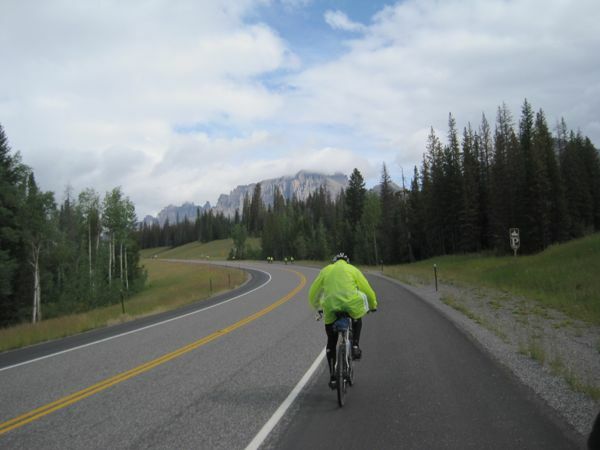 I can say with certainty that the only thing that enabled me to make it up the second hill to Grand Targhee was our rest stop at Fitzgerald’s – a bike shop in Victor that has a coffee shop inside (genius!! ).